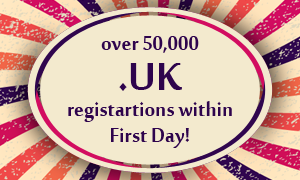 The number of registrations within the first 24 hours of opening, of the new .UK domain have surged to a record-breaking high, exceeding 50,000. The newly registered names include STEPHENFRY.UK, SAINSBURYS.UK, BENTLEY.UK and BURBERRY.UK. Following such a successful start, the .UK domain may become one of the fastest selling new domains on record, and outperforming the first day sales for all other new generic TLDs by a large margin. Keen interest has been expressed in .UK domains by consumers and brands alike, demonstrating their trust in the shorter national domains. Brands that registered their domain names within .UK shortly after its release include Sainsbury’s, Bentley and Burberry. There are currently more than ten million registered UK domain holders that will be offered preference on the new shorter equivalent domain name within the .UK extension. Research shows that about 75 per cent of Internet users in the UK prefer shorter more concise website addresses, similar to other national domains such as .DE (Germany) or .FR (France). To register a new .UK domain name or find out more about available options of registering a .UK domain, click on the extension. Our Support Team is available for assistance at support@web-solutions.eu or via phone on +44 (0) 208 133 3994.